You are going to Watch Kaijudo: Rise of the Duel Masters Episode 20 online free episodes with HQ / high quality. 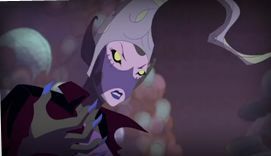 Stream cartoons Kaijudo: Rise of the Duel Masters Episode 20 Online Heart of Darkness, Part 2.With Allie a prisoner of Megaria, Ray and the others formulate a plan to rescue Allie and return home with the Shield of Unity. Meanwhile, Alakshmi enters the Darkness Civilization in order to redeem herself to Choten and claim the Shield of Unity only for Megaria to have Razorkinder Puppet of Miasma Pit knock out Alakshmi. Now Megaria has Allie and Alakshmi fight each other to see who will become her pawn in a plot to expand her territory.